Our March Winners are Announced! Another beautiful sunset in Pine Mountain Georgia, spent with great friends, enjoying great weather, and creating great memories. One of our new guests decided to entertain us with this song. Put moth balls near the propane lines of the water heater and refrigerator. This will deter spiders. 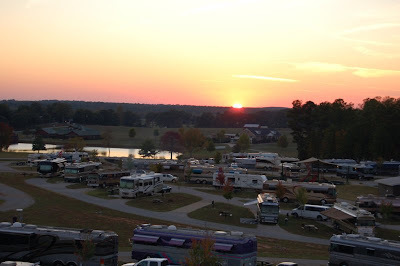 To protect your RV’s plumbing, use a water pressure regulator when connected to any water source. Use an auto battery charger to charge your batteries. Have quarters available for unexpected events such as meter parking, coin-operated showers, laundry, tolls etc. To avoid blow-outs, tire damage and to optimize gas mileage, maintain proper tire pressure. Should be checked often. Use a plug-in voltage meter to monitor amps. Despite your rig’s abilities, you can only use up to the amps available from the source. Always drain the black-water holding tank first. Then drain the gray-water. This helps to clean out your hose. Use your generator to operate the roof air conditioner instead of the dash A/C. It cools your rig down quicker. Your vehicle’s engine will not get so hot and it will run more efficiently. Use an outside sediment water filter on any water source. Use Velcro tape for hanging and fastening things in your RV. Save power by using fluorescent lights. To conserve power, run the water heater only when necessary. RV furnaces use a lot of power. To conserve your power supply, lower the heater temperature, wear warmer clothing and use an extra blanket. Park your RV in shady locations and use your awning to keep it cooler inside. Put screen wire in your rubber bumper plugs to prevent bees from nesting. 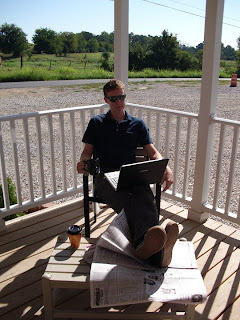 Surfing the web on a beautiful Arkansas morning, Catherine's Landing assistant manager - Ian loves to stay connected everywhere he goes. Coffee coupled with fresh air is the best way to kick off the day. "The free Wi-Fi, amazing view, and the people are my favorite parts of Catherine's Landing...and did I mention the huge lake?" To show appreciation to our fans on Facebook, we've decided to give a complimentary weekend vacation to one lucky winner each month. For Pine Mountain, Carrabelle Beach, Live Oak Landing, and our newest addition Catherine's Landing, each person who "liked" the property's Facebook page was automatically entered in a random drawing to be done at the start of the month. This included our former fans, too! Click any of the proerty names above to be directed back to their Facebook pages. If you're not already a fan, be sure to click "Like" and become one so you have a chance to be the winner next month! Thanks for visiting and staying updated! Make sure you also check out the specials that were posted this week, too.